Ultimately, it happens to everyone. You’re looking out the window, nice and warm inside the house, on a rainy day thinking to yourself “wow, it is miserable out there. It would sure be awful to have to work in that weather”. And just about the same time you’re thinking about how comfortable you are in your house, you suddenly look up and there’s a drop of water coming out of the ceiling. Emergency? Put it off for another day? Get up there and put tar on the roof? Really, most of us don’t know what to do when our roof starts to leak. This article is written for those who need a straight answer. First of all, from a safety point of view, getting up on the roof during a torrential rainstorm is not going to be a safe outing. Sure, you need to solve the problem; otherwise the sheetrock will become more and more damaged. But by throwing a ladder up onto the gutter and climbing onto the roof in hopes of being able to find what the problem is, or to put tar on the roof, is not going to stop the damage that has already occurred to the sheet rock. Frankly, by the time you see the water coming in; the damage has already been done. 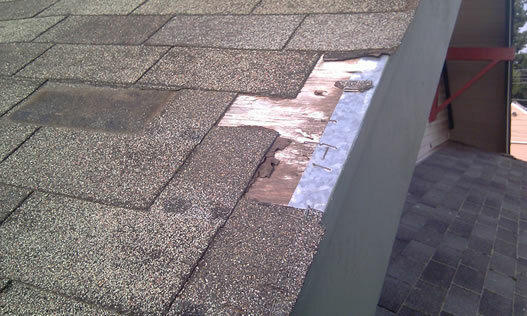 Where a roof leak becomes expensive is when the roof repair that needs to take place is delayed for an extended period of time. By calling your insurance agent to see if your homeowner’s insurance covers the roof repair, you can get some great advice as to how to proceed. Your insurance agent will have a list of reliable roofing companies that they’ve used before for this type of situation, or they can advise you how to get the interior damage repaired after the roof has been fixed. In most cases your homeowner’s insurance will not pay for the roof to be repaired, but will pay for the interior damage to your home, as long as you have acted promptly and protected your home from further damage of the roof leak. This of course is after you pay your deductible, which typically is around $500 or more, some in reality you will probably never pay more than your deductible for the entire amount of the interior damage. 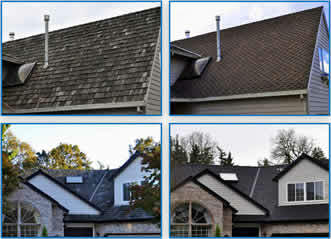 When calling a roofing company, don’t be upset if they don’t drop everything and arrive in minutes. The real truth is that it rained that hard over the entire area, and there have probably been two or three phone calls that came in before yours. Actually, by demanding that someone would be there instantaneously, this may end up costing you a premium. 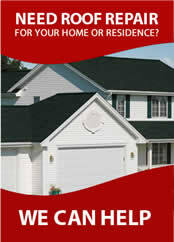 The best thing to do is to keep your cool and let the roofing professionals get there according to their schedules. If all else fails, consider placing a tarp on the roof to stop further water intrusion. This should the last case scenario because of the danger of all of climbing a ladder and getting on your roof, the possibility of slipping off the roof, or further damage to your roof by not knowing where to step or what to do. Properly installed, a tarp will keep the water out of the house. But you need to know how to install it, so that the wind doesn’t blow it off, or that you simply don’t place it in the wrong spot. Whatever you do, please do not get out your trusty old can of tar and start slapping it all over the place. This makes it impossible for the roofer to even find what the problem is, let alone the fact that this material is going to be all over everything when the job is done.